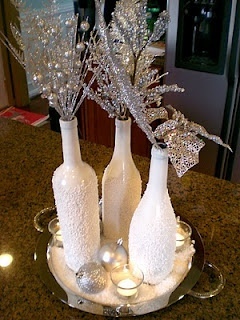 Create a wonderful Christmas or winter centerpiece using this wine bottle craft from Tracie Stoll! You'll turn something destined for the recycling bin into a gorgeous and dramatic centerpiece, perfect for holiday parties. Gather 3 bottles. One was a bit taller than the other 2. Spray a coat of primer on them. Let them dry and get out the Epsom salt (found in the drug section area near first aid). 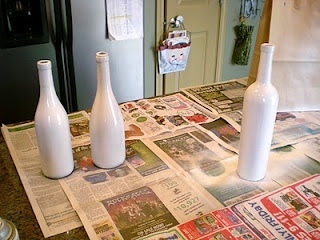 Spray the bottles with some craft bond spray adhesive. 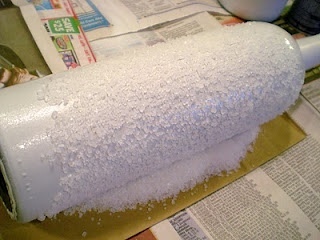 Roll the tacky bottle in some Epsom salt. Place the bottles on a silver platter. Also spread some extra Epsom salt around the tray. Place a few small silver balls along with 3 votives. Inside the wine bottles, stick in some silver pics from Michael’s. Love this idea of using Epsom salts. I am wondering with all the rage of Himalayan salt, if you could use those crushed crystals that would provide a pretty pinkish glow to this,project, and perhaps extend the idea for Valentine's Day using red and pink and silver sparkling picks! 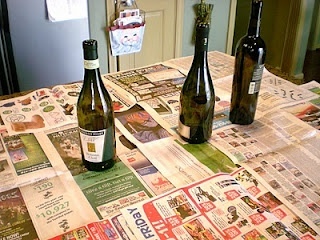 Either way, it is a pretty idea and a great way to use those pretty wine bottles, giving them new life! Thanks! This is the most elegant and most thrifty craft! Nobody would believe it was decorated using salt. Bottle crafts always look great as decorative pieces on the house and this is one you should definitely try. Just follow the step by step tutorial. I have used the glitter before and they make very clever gifts. If you use on with a bigger hole on top you can also add soe lights like my daughter did for a barbeque she had at night on deck it was so pretty. She got so many compliments on them. Super easy and great tutorial. This is fascinating! It's very useful during parties and holidays. You can also use glitter instead of epsom salt. And maybe make it colorful for other events. Very clever! What an inexpensive, easy, pretty idea! I love the look, it's almost like Snow Babies. I have done something similar. Take a plastic round ornament, the see thru kind and stuff some cotton into the inside bottom. Then do the outside of it like these bottles. I did it half way up and then wrote holiday greetings in silver markers above the snow. My favorite said Let it Snow. I live in Florida ! This would make awesome winter wedding decor. I will try this festive decoration next year...out of time for the present one. It really looks easy yet so pretty! What a beautiful project. Love it. 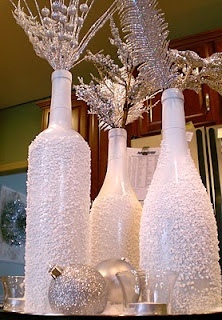 This is the perfect project to try if you hosted a holiday party and found yourself with empty wine bottles. I'm going to have to try this myself! It's so unique. This is really pretty and easy to do, not sure if my cats would leave it alone though...Might make it up as a gift, send along more picks, etc. for different seasons? No, I would not make this project. Then please don't bother to comment! I for one love it, I just don't know how to get the wine bottles? May need to stay up late to try this out. I would definitely try this project. A week ago I purchased 2 wine bottles to find a project for which to use them. I love it!!! It looks beautiful and elegant. Beautiful! Maybe next year as this year's table is already sorted. My household doesn't drink wine, so the project has no appeal for me. Of course, the same process would apply to jars. How might the Ebsom salts be tinted? If this is doable, please describe the process. Beautiful craft! Very Cute project. I would make this! I've just seen it and I hope I will get time to make it. It looks lovely, and will go well with my decor. Haven't made it but it looks lovely and is something worth making. I will in the future. I like them. I think they would be prettier if you could have used a glass cutter and cut off part of the neck of the bottle. They would look more like a vase than a bottle. I like these and will probably make them for my centerpiece. The trouble will be finding 3 bottles of different sizes. I love this! It looks so elegant yet it is so easy to do. I don't drink wine but I can see doing this with any shaped bottle. I can't wait to get started!! I love this project! I made them and added a little white glitter and put some twigs with red berries in them. They are beautiful on my fireplace hearth! I never would have thought to use Epsom salts...what a great idea! I made a similar project over the summer using textured paint on wine bottles and then painted them turquoise and added starfish on bead "necklaces"... Your project is stunning and would be a beautiful addition to a Christmas/Winter display! Wow I would like to make this! Its so very easy and looks good! Once I find out of, what Epsom salt is here i Denmark, I will buy some and make the bottles! 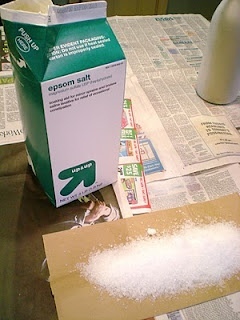 Found out that Epsom salt is the same as magnesiumsulphate - so I will search for that! This is a great idea! I haven't thought of using salt to give this effect. You did a great job on this one. Beautiful and easy to make too! Its really great! I'm going to try this. Thanks! I wonder how well this would work on acrylic baubles..? I made several of these last year & Loved them however the (snow) kept falling off so I sprayed them with a clear fixative & that helped a lot. Good to know. I am making these this Christmas. Son muy lindas estas botellas decoradas. Such a cool idea and great way to turn an empty bottle into something new! I'm going to try this. Thanks! Can you use any kind of bottle? We don't have any wine bottles. it looks beautiful. Question, will any kind of primer adhere to the glass? Like it it looks like Christmas. This is really pretty. And I got rid of a few wine bottles because I didn't know what to do with them. An additional step to this could be to spray the bottle after applying the epsom salt, with a poly coating to protect it. Maybe even add just a little glitter here & there over the bottles. I think I'm going to make up a bunch of these to offer at the craft fair in September. Also wanted to say, it looks like this is being done in the kitchen. I would probably want to do this outside to avoid overspray. Nice idea but Epsom salt is not saft to use if someone touches is & puts it to their mouth that would not be safe. Better to use other product that is not close to food. You could also spray with different color paint then use contrasting glitter or such. Epsom salt is non toxic.